Bajrang Punia failed by an inch to end the country’s eight-year long wait for a gold medal at the World Wrestling Championships but still fought enough to etched his name in history books. On Monday, Haryana’s star from Sonepat lost to Japan’s Takuto Otoguro in the men’s freestyle 65kg division final to settle for silver in Budapest, Hungary. 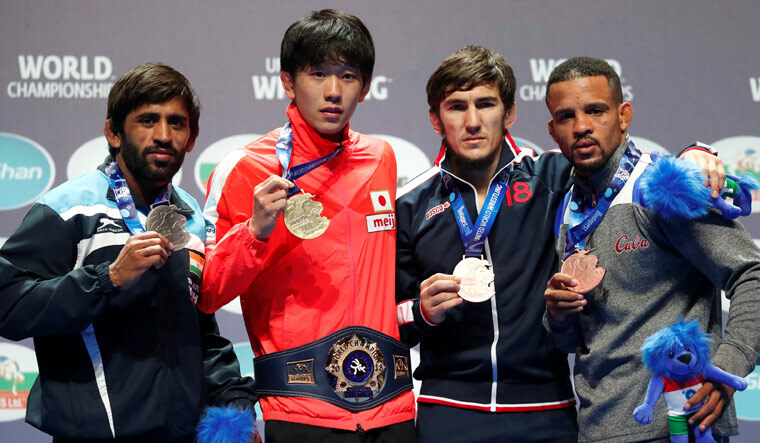 At Laszlo Papp sports arena, the 24-year old fought Bajrang fought with full passion and energy but in a closed fist couldn’t break past the solid defense of his Japanese opponent, who won the title with a 16-9 verdict. Although Otoguro was accused of delaying tactics in both the quarters, for which he was even booed by the capacity crowd, the fact that cannot be ignored is Otoguro was a better wrestler on the day. However, Bajrang still feels proud of his achievement to the final as he became the first Indian Wrestler to win two medals at the Worlds. But when the history unfolds, we still find Sushil Kumar as the lone gold medalist who won the top prize at the 2010 edition in Moscow. Bajrang is one rare wrestler who holds a distinction- he has won medals at the three major events in a single year. Before coming to the Worlds, Bajrang stood to stand still against strongest at the Gold Coast Commonwealth Games and Jakarta Asiad this year. “It was so near and yet so far,” Bajrang reacted, speaking from Budapest. “I’ve reached the final but I guess I’ve to be satisfied with the silver medal. I am happy to have bettered my bronze medal effort, achieved five years ago at the same venue,” he added. The same day, both Pankaj Rana (70kg) and Mausam Khatri (97kg) rattled out with a fizz. Also, read; Winning tale of a disabled man.